Australia’s top rated three-year-old colt All Too Hard collected another Group 1 victory at Caulfield on Saturday, adding the weight-for-age C.F. Orr Stakes over 1400m to his Caulfield Guineas win earlier this season. 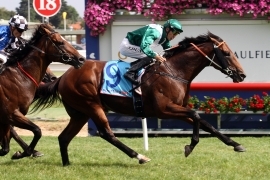 All Too Hard ($1,025,000 2011 Easter, 3c Casino Prince-Helsinge) was rated the equal World Champion 3YO Miler recently by the International Federation of Horseracing Authorities, but just as 1999 Caulfield Guineas winner Redoute’s Choice had to do in 2000 the three-year-old had to defeat hardened weight-for-age gallopers in today’s event. Jockey Dwayne Dunn was told to ride All Too Hard like the best horse in the race and after settling towards the rear of the field the colt scorched down the centre of the track to claim the $400,000 feature over Group 1 winners Mawingo, Mr Moet, Wall Street and King Mufhasa. “It was good effort and he did a good job because the ways the races have been run today it’s been pretty leader biased and there hasn’t been much coming from behind. The last thing I said [to Dwayne] was ‘you’re on the best horse so ride him like it,” said co-trainer Wayne Hawkes. Team Hawkes have had great success in the CF Orr Stakes having produced Yell and Lonhro to win the Group 1 race in the past. Wayne was quick to draw strong comparisons between All Too Hard and 2004 Australian Racehorse of the Year and now Champion Sire Lonhro. “When they went across the line Dad came up and shook my hand and I said ‘it feels a lot like the Lonhro days’. There is no better thrill than winning a Group 1, but it was a lot like Lonhro,” Wayne said. “The pressure is on, but you just want to keep his record intact and get everything right. He’s not screwed down yet. He’s got a fair way to go. Bred by Gilgai Farm, All Too Hard was sold to Hawkes Racing on behalf of Patinack Farm for $1,025,000 at the 2011 Inglis Australian Easter Yearling Sale. Since his courageous second placing in the W.S. Cox Plate the valuable colt has been acquired by Vinery Stud, who have Royal Ascot aspirations for the galloper. “We'd like him to go to stud this year, so we'd like to see him retiring a month or so prior to the (breeding) season,” Vinery Stud manager Peter Orton told Racing Victoria this week. “We're looking to race him here and, if all goes well, then take him to England, to Ascot, if possible. “There's the Queen Anne, but you've also got the Golden Jubilee over 1200. That's a tough race, there's a rise three times, and you have to have a bit of stamina. But the Queen Anne over a mile is ideal for him and there are a couple of other nice races for him in France. “Black Caviar has put that family on the map and she's known all over the world and this is a half-brother to her, so he's got great interest and great potential for overseas farms. “If he was to go over there and add to his record, it will just increase the value of the horse, which would be a great thing,” Orton said. Today’s victory was a unique feat for outstanding broodmare Helsinge, whose famous daughter Black Caviar won last year’s C.F. Orr Stakes. Helsinge’s current yearling, a colt by Redoute's Choice, will be offered as Lot 131 by Three Bridges Thoroughbreds as agent for Rick Jamieson's Gilgai Farm at the 2013 Inglis Australian Easter Yearling Sale. There were huge cheers from the owners enclosure at Caulfield when astute buys Octavia and Budriguez saluted at stakes level, with both gallopers earnings far eclipsing their yearling sale purchase prices. Octavia ($42,000 2011 Premier, 3f Holy Roman Emperor-Filming) had her owners jumping up and down when she clung on to take out the $120,000 Listed MRC Kevin Hayes Stakes over 1200m for three-year-old fillies. The daughter of Holy Roman Emperor has earned $156,700 for her connections, which is 3.7 times the $42,000 purchase price paid by Paul Moroney for the filly from the draft of Newgate Farm at the 2011 Inglis Melbourne Premier Yearling Sale. Budriguez ($25,000 2008 Classic, 6g Al Maher-Deni) later claimed the Group 3 MRC Carlyon Cup (1600m) in a fighting finish with Group 1 winner Invest. The son of Al Maher was purchased by trainer David Jolly from the Inglis Sydney Classic Yearling Sale for $25,000, which is just a fraction of the $478,250 the galloper has earned so far in his 27 start career. Trainers Paul Messara and Jason Coyle were not afraid to name two of Sydney’s autumn features as the realistic aims for their respective gallopers Vadashan and Va Persiero they saluted at Warwick Farm on Saturday. Va Pensiero (P$35,000 2012 Classic, 2c Stratum-Rosmarino scored in the Australian Turf Club Handicap over 1000m, putting him in the running for the Group 1 ATC Golden Slipper (1200m), an aim that trainer Jason Coyle say’s is not out of the question. "It [the Golden Slipper] is definitely in the plans but you just never know with two-year-olds,” Coyle said. "Right now if everything goes to plan the Silver Slipper (March 2) and the Todman Stakes (March 23) are the races we have in our minds to try and get there,” Coyle added. Later in the day Vadashan ($440,000 2011 Easter, 3c Redoute’s Choice-Vadsalina) took his record to two wins from two starts when winning the ATC Sydney Carnival Handicap over 1600m. Trainer Paul Messara was quick to declare that the colt possesses the ability to contest the Group 1 ATC Australian Derby (2400m) in April. “I’ve always had him pencilled in as my Derby horse,” Messara said. “He’s beautifully bred, has always shown me ability and no trouble getting a trip. “He’s still learning what to do. He gets away from them and almost waits for them so as long as he can keep learning how to race he’ll continue to get better,” Messara added. Buyers next chance to Aim Higher with a yearling from Inglis comes up at the 2013 Inglis Melbourne Premier Yearling Sale at Oaklands on 3, 4, 5 & 6 March. Following on 9, 10 & 11 April in Sydney is the 2013 Inglis Australian Easter Yearling Sale. Both catalogues are available online at www.inglis.com.au and on the updated Inglis Sales iPad App.